Susan Ashbrook was born circa 1864 at Kentucky. She was the daughter of Francis W. Ashbrook and Celestia Sleet. [S246] U.S. Federal Census 1880 U.S. Federal Census, by Ancestry.com, NA Film Number T9-0438. Page 409A. ED161. Dwelling 239. Elizabeth Ashbrook was born circa 1867 at Kentucky. Adaline Ashbrook was born circa 1869 at Kentucky. Married Name 30 October 1856 As of 30 October 1856,her married name was Schoonover. Lucinda Hatton was born circa 1835 at Indiana. She was the daughter of Robert Hatton and Sarah (?). Lucinda Hatton married Morris Schoonover on 30 October 1856 at Switzerland, Indiana. Lucinda Hatton died after June 1880. Clarence Schoonover was born circa 1860 at Indiana. Name Variation Ernest Schoonover was also known as Sigel. Ernest Schoonover was born circa 1863 at Illinois. Harry Schoonover was born circa 1872 at Illinois. Charles Schoonover was born in April 1880 at Illinois. Arthur Benjamin Williams was born on 9 September 1881 at Florida. Arthur Benjamin Williams married Bessie Alice McClain, daughter of Albert McClain and Alice Tyack Richards, circa 1909. Arthur Benjamin Williams died before 1940 also reported as Oct 1965. William F. Richards was born in July 1864 at Wisconsin. He was the son of William B. Richards and Mary Jane Tyack. William F. Richards married Mary F. (?) circa 1894. William F. Richards died after April 1930. [S246] U.S. Federal Census 1880 U.S. Federal Census, by Ancestry.com, NA Film Number T9-1427. Page 338C. ED123. Dwelling 114. [S245] U.S. Federal Census 1900 U.S. Federal Census, by Ancestry.com, ED4. Dwelling 76. [S244] U.S. Federal Census 1910 U.S. Federal Census, by Ancestry.com, ED53. Dwelling 4. [S243] U.S. Federal Census 1920 U.S. Federal Census, by Ancestry.com, Year: 1920;Census Place: Okaton, Jones, South Dakota; Roll: T625_1721; Page: 6B; Enumeration District: 105; Image: 810. [S250] U.S. Federal Census 1930 U.S. Federal Census, by Ancestry.com, ED19. Dwelling 228 #5. Arthur Richards was born circa 1867 at Wisconsin. Name Variation Frederick A. Richards was also known as Fredrick. Name Variation Frederick A. Richards was also known as F. A. Name Variation Frederick A. Richards was also known as Frederic. Name Variation Frederick A. Richards was also known as Fred. Frederick A. Richards was born in March 1872 at Wisconsin. Frederick A. Richards married Rose Coomans, daughter of Charles Coomans and Mary Augusta Davis, circa 1901. Frederick A. Richards died on 29 November 1950 at Meade, South Dakota, at age 78. [S244] U.S. Federal Census 1910 U.S. Federal Census, by Ancestry.com, ED35. Dwelling 45. [S243] U.S. Federal Census 1920 U.S. Federal Census, by Ancestry.com, ED143. Dwelling 37. [S250] U.S. Federal Census 1930 U.S. Federal Census, by Ancestry.com, ED26. Dwelling 231. Name Variation Frederic John Maring was also known as Freiderick J. Name Variation Frederic John Maring was also known as Friderich John. Name Variation Frederic John Maring was also known as Mering. Frederic John Maring was born on 10 August 1807 at Burch, Ewrach, Bavaria, Germany. He was the son of Caspar Ortes and Margaret Maring. Frederic John Maring married Anna Barbara Meyer in 1842 at Germany also reported as Pennsylvania. Frederic John Maring died on 27 January 1888 at age 80. He was buried after 27 January 1888 at Jamestown Cemetery, Grant, Wisconsin. [S249] U.S. Federal Census 1850 U.S. Federal Census, by Ancestry.com, Dwelling 1173. [S247] U.S. Federal Census 1870 U.S. Federal Census, by Ancestry.com, Page 1. Stamp 335. Dwelling 3. [S246] U.S. Federal Census 1880 U.S. Federal Census, by Ancestry.com, NA Film Number T9-1427. Page 280B. ED120. Dwelling 90. [S344] Wisconsin, History of Grant County Wisconsin, Town of Paris, Biographical Sketches, Page 1035. Name Variation Anna Barbara Meyer was also known as Barbary. Married Name 1842 As of 1842,her married name was Maring. Anna Barbara Meyer was born on 29 December 1818 at Bavaria, Germany. She married Frederic John Maring, son of Caspar Ortes and Margaret Maring, in 1842 at Germany also reported as Pennsylvania. Anna Barbara Meyer died on 26 January 1899 at age 80. Name Variation Fetus Maring was also known as Festus. Name Variation Fetus Maring was also known as Phetus. Name Variation Fetus Maring was also known as Fides. Fetus Maring was born on 4 September 1840 at Bavaria, Germany. He was the son of Frederic John Maring and Anna Barbara Meyer. As of 1 June 1905, Fetus Maring was never married. He died on 30 March 1907 at age 66. He was buried after 30 March 1907 at Jamestown Cemetery, Grant, Wisconsin. Festus enlisted in Co. I, 25th W. V. I., Aug. 6,1862; served through the war and was discharged June 7, 1865; he is a member of the Town Board, and a member of the fraternity of Odd Fellows. Name Variation John Frederick Maring was also known as Friederick. Name Variation John Frederick Maring was also known as Frederic. Name Variation John Frederick Maring was also known as Fred. John Frederick Maring was never married. He was born on 26 February 1855 at Wisconsin. 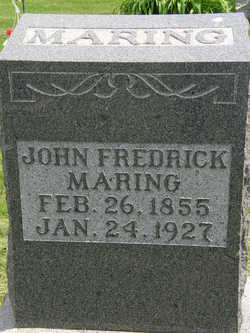 John Frederick Maring died on 24 January 1927 at near Louisburg, Grant, Wisconsin, at age 71 Fred Maring obituary. He was buried after 24 January 1927 at Jamestown Memorial Cemetery, Jamestown, Grant, Wisconsin. 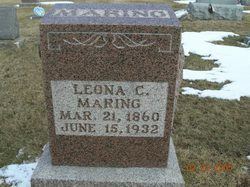 Name Variation Leona C. Maring was also known as Leone. Name Variation Leona C. Maring was also known as Leony. Leona C. Maring was born on 21 March 1860 at Wisconsin. She was the daughter of Frederic John Maring and Anna Barbara Meyer. As of 1 June 1905, Leona C. Maring was never married. She died on 15 June 1932 at Wisconsin at age 72. She was buried after 15 June 1932 at Jamestown Cemetery, Grant, Wisconsin. Name Variation Francis Albert Kuhle was also known as Frank. Francis Albert Kuhle was born on 25 February 1889 at Sinsinawa, Grant, Wisconsin. 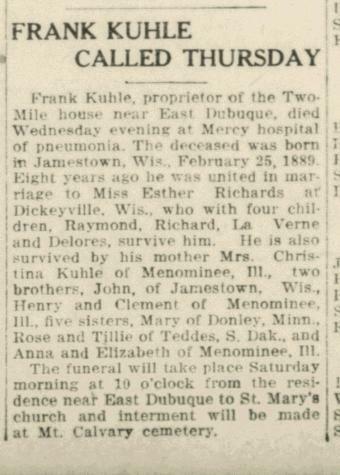 He was the son of Clements J. Kuhle and Christina Anna Freese. 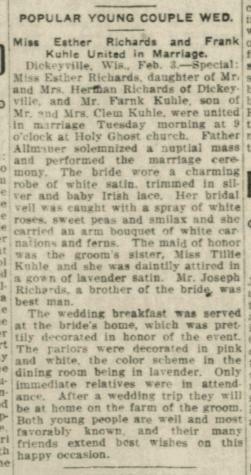 Francis Albert Kuhle married Esther Rose Richard, daughter of Herman J. Richard and Katherine Montag, on 30 January 1912 at Holy Ghost Church, Dickeyville, Grant, Wisconsin, Esther Richards and Frank Kuhle marriage announcement. 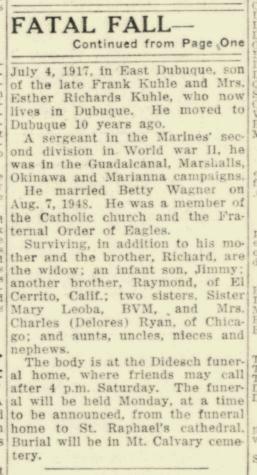 Francis Albert Kuhle died on 27 November 1918 at Dubuque, Dubuque, Iowa, at age 29 Frank Kuhle obituary. Raymond C. Kuhle was born circa 1913 at Wisconsin. He was the son of Francis Albert Kuhle and Esther Rose Richard. Raymond C. Kuhle married Elizabeth Fall, daughter of George E. Fall, in June 1938 Elizabeth Fall and Raymond Kuhle engagement and marriage announcements. Raymond C. Kuhle died in November 1959 at California Raymond C Kuhle obituary. Richard Emil Kuhle was born on 16 December 1913 at East Dubuque, JoDaviess, Illinois, also reported as Wisconsin. 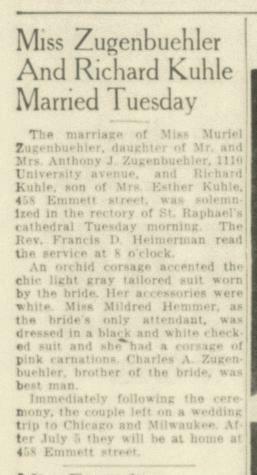 Richard Emil Kuhle married Muriel Zugenbuehler in June 1947 Muriel Zugenbuehler and Richard Kuhle marriage announcement. 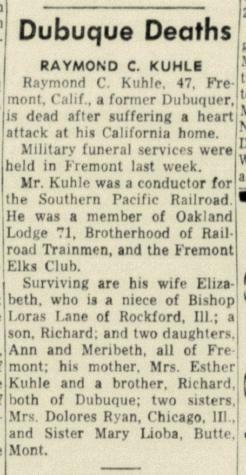 Richard Emil Kuhle died on 12 January 1977 at Dubuque, Dubuque, Iowa, at age 63. Name Variation Dolores Kuhle was also known as Delores. Married Name 15 October 1940 As of 15 October 1940,her married name was Ryan. Dolores Kuhle was born circa 1916 at Wisconsin. She was the daughter of Francis Albert Kuhle and Esther Rose Richard. 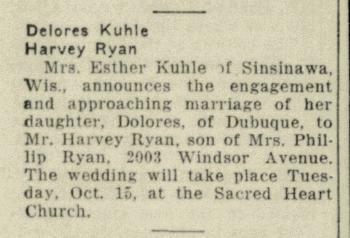 Dolores Kuhle married Charles Harvey Ryan on 15 October 1940 at Dubuque, Iowa, Delores Kuhle and Harvey Ryan engagement announcement. Name Variation LaVerne Henry Kuhle was also known as Lavern. LaVerne Henry Kuhle was born on 4 July 1917 at East Dubuque, Wisconsin. 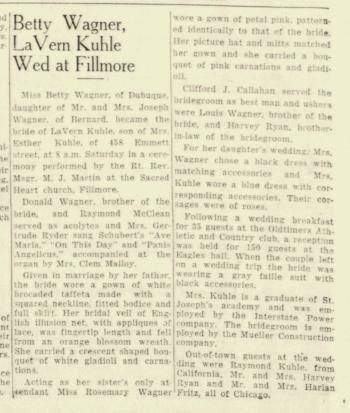 LaVerne Henry Kuhle was the best man at the wedding of Elizabeth Fall and Raymond C. Kuhle in June 1938; Elizabeth Fall and Raymond Kuhle engagement and marriage announcements. LaVerne Henry Kuhle married Betty Wagner, daughter of Joseph Wagner, on 7 August 1948 at Fillmore, Grant, Wisconsin, Betty Wagner and Lavern Kuhle engagement and marriage announcements. LaVerne Henry Kuhle died on 10 June 1949 at died while working on a bridge at age 31 LaVerne Henry Kuhle obituary. Name Variation Clementine Kuhle was also known as Sister Mary Lioba BVM. Clementine Kuhle was born circa April 1919 at Wisconsin. Willard C. Klemme was born in 1921 at Indiana. He was the son of Wilhelm Friedrich Klemme and Emma Peters. Willard C. Klemme was buried in 1948 at Saint Pauls Lutheran Cemetery, Kankakee, Illinois. [S250] U.S. Federal Census 1930 U.S. Federal Census, by Ancestry.com, ED46-50. Dwelling 149. Name Variation Gottfried Truebgar was also known as Truebger. Name Variation Gottfried Truebgar was also known as G.
Name Variation Gottfried Truebgar was also known as Godfrey. Gottfried Truebgar was born in October 1826 at Saxony, Germany. He married Henrietta Wagner circa 1850. Gottfried Truebgar died after May 1910. Gottfried Truebgar immigrated in 1851 also reported as 1850. [S248] U.S. Federal Census 1860 U.S. Federal Census, by Ancestry.com, Page 24. Dwelling 164. [S246] U.S. Federal Census 1880 U.S. Federal Census, by Ancestry.com, NA Film Number T9-0243. Page 132A. ED86. Dwelling 348. [S245] U.S. Federal Census 1900 U.S. Federal Census, by Ancestry.com, ED60. Dwelling 201. [S244] U.S. Federal Census 1910 U.S. Federal Census, by Ancestry.com, ED84. Dwelling 308. Married Name circa 1850 As of circa 1850,her married name was Truebgar. Married Name circa 1850 As of circa 1850,her married name was Truebger. Henrietta Wagner was born in May 1825 at Saxe Weimer, Germany. She married Gottfried Truebgar circa 1850. Henrietta Wagner died before 1910. Henrietta Wagner had 10 with 5 living in 1900 children. Name Variation Frederick Albert Truebger was also known as Truebgar. Name Variation Frederick Albert Truebger was also known as Fred. Name Variation Frederick Albert Truebger was also known as Albert. Frederick Albert Truebger was born in July 1864 at Illinois. He was the son of Gottfried Truebgar and Henrietta Wagner. Frederick Albert Truebger married Lydia F. (?) circa 1891. [S238] Illinois Death Records, by Illinois, certificate 0003019. [S245] U.S. Federal Census 1900 U.S. Federal Census, by Ancestry.com, ED51. Dwelling 93. [S244] U.S. Federal Census 1910 U.S. Federal Census, by Ancestry.com, ED72. Dwelling 4. [S243] U.S. Federal Census 1920 U.S. Federal Census, by Ancestry.com, ED78. Dwelling 186. James M. Parr was born circa 1868 at Illinois. He married Iva Lillie Mercer, daughter of Amosa Harrington Mercer and Ellen Connie Flora, on 30 December 1914 at Rippey, Iowa. James M. Parr and Iva Lillie Mercer were divorced before 1925. [S243] U.S. Federal Census 1920 U.S. Federal Census, by Ancestry.com, ED118. Dwelling 48. Married Name 14 November 1872 As of 14 November 1872,her married name was Newbold. Eliza Ann Newhouse was born in 1848 at Jackson, Rush, Indiana. She was the daughter of George W. Newhouse and Nancy Kirkpatrick. Eliza Ann Newhouse married James T. Newbold on 14 November 1872 at Rush, Indiana. [S246] U.S. Federal Census 1880 U.S. Federal Census, by Ancestry.com, NA Film Number T9-0308. Page 86A. ED83. Dwelling 5. James T. Newbold was born circa 1851 at Indiana. He married Eliza Ann Newhouse, daughter of George W. Newhouse and Nancy Kirkpatrick, on 14 November 1872 at Rush, Indiana.